"A section of the bench has flipped up and turned into the backrest. Poles wrap around each other to become a coat stand. By adding flipped, bent and wrapped details to metal sheets and rods, the ordinarily hard metal gain new functionality and a light, flexible feel, as though the metal has become paper or cloth". 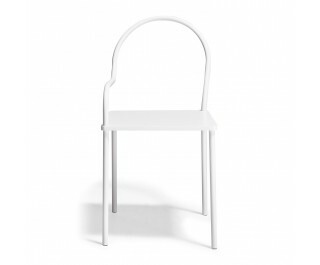 Nendo Chair with steel frame and seat made of aluminium plate mm15. Mat white or matt black lacquered.